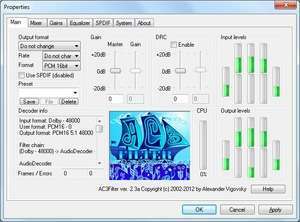 AC3Filter is an open source AC3 decoding filter that allows you to watch videos with AC3-encoded surround audio. After you install the filter, all video players, including Microsoft's Windows Media Player, that use DirectShow, should be able to play AC3 audio correctly. Filter also supports ProLogicII audio as well. For security reasons, you should also check out the AC3Filter download at LO4D.com which includes virus and malware tests. Additional screenshots of this application download may be available, too. 4.9 out of 5 based on 19 ratings. AC3Filter download been highly rated by our users.